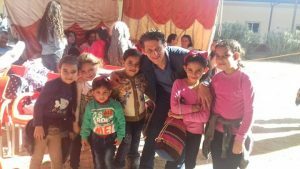 When the Family of Jesus team recently returned from Aswan, Presenter Mina Awny was full of compassion for the children he met in the Egyptian city. Although a popular tourist destination, Aswan is very remote, lying almost 900km south of Cairo in a region often described as neglected. Adults often have very little education, and even many churches can provide only minimal family support. As a result, some parents are raising their children the same way they were brought up – in an atmosphere of fear and violence. Family of Jesus Presenter, Mina Awny, with children at the worship event in Aswan, Egypt. Meeting these deep needs lay at the heart of the trip to Aswan, where the Family of Jesus team held a special children’s worship session hosted by the ministry Voice of a Generation. Around 300 children aged 8-13 gathered for the encouraging event, along with 200 adults. Since church leaders rarely visit the region, this was a precious opportunity for the children from Aswan and nearby Kom Ombo. The theme of the songs and teaching was ‘The heavens are open and listening’. “We wanted to show the children that heaven is not far away – that they can lift up their hearts to God in prayer and He will answer them,” Mina explains. Afterwards, the team divided up to pray with the children in small groups. Although the event was not broadcast on Family of Jesus, several children from Aswan called in live during the first episode after the visit. Their words showed that the love they received had stayed with them. “I enjoyed the worship session very much, especially the prayers and the praise. I felt I could hear Jesus’ voice,” said 10-year-old Blessy. The trip was one of several made by the popular show in recent months. In November, the show broadcast a special episode from Assiut, where a large auditorium filled with the beautiful sound of 800 children singing to Jesus. “This is what heaven will be like,” he adds.